As we announced a couple of weeks ago, Dynamic Bicycles offered us the rare opportunity to test-ride their newest offering before anyone else outside their company. While I only got to keep the bike for a shortish test period (two weeks), I put a lot of miles (close to 200) on the bike and was able to get a great feel for it. Here’s some background: Billed by Dynamic as “the world’s first production internally-geared road bike�?, this bike is aimed at the performance enthusiast who likes to think outside the box. With a drivetrain based around a Shimano Alfine 8-speed internally-geared hub, the other item that really makes this bike stand out is the STI-style shifter co-developed by Dynamic and the Taiwanese component manufacturer Sussex. The shifter is branded “Versa”. 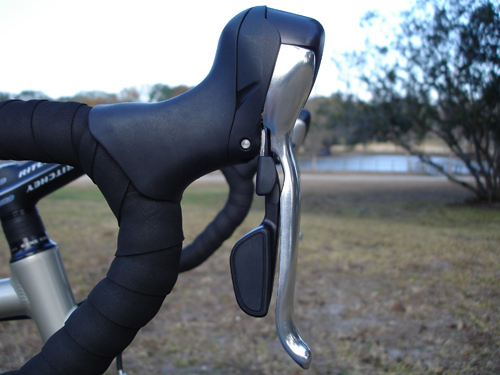 This shifter is the first of its kind for internal hubs…prior to the development of this shifter, the two choices were a twist-grip shifter and a trigger assembly for flat bars (although a barend shifter set recently became available as well). The frame is configured in a fairly commonplace compact-geometry format, with a slightly extended headtube for a bit of added comfort and a slightly less aggressive riding position. 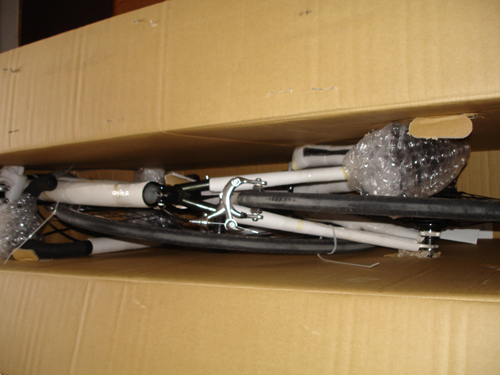 There are rack-mounting points on the seatstays but no corresponding eyelets on the rear-facing fork ends. Dynamic has addressed that oversight in the production version; there WILL be eyelets back there. The frame itself is TIG-welded with nice clean beads. The fork is carbon fiber with polished aluminum dropouts and an alloy steerer. Like the OSO we reviewed a few months ago, the fork comes with eyelets for fender mounting…but there’s virtually no clearance between fork crown, tire and brake arches. It’s not clear if these eyelets have carried over into the production bike. Aluminum-frame-haters, you might be surprised: this frame isn’t harsh at all. 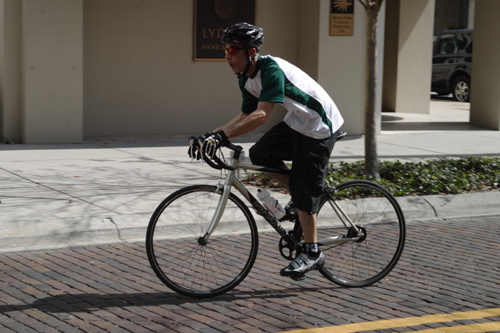 In fact, I found it surprisingly comfortable for long rides and rides over some pretty rough streets, including the many brick streets of central and south Tampa. Part of that comfort is the riding position, part is courtesy of the carbon/aluminum fork and part of it comes from the 25mm tires (up to 28mm tires should fit in this frameset with no clearance issues). The main thing, though, is that a comfortable frame can be made out of any of the major frame materials, and I think Dynamic crafted a good one here. Let’s talk about the drivetrain, seeing as how that’s where a lot of the excitement about this bike centers around. 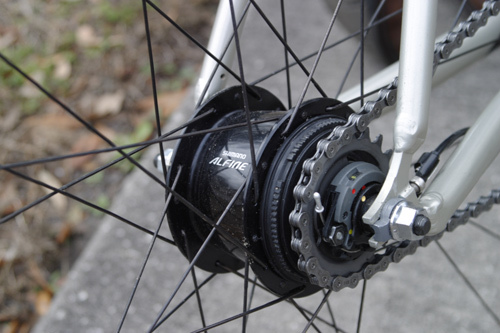 The Alfine hub is a proven performer — easy to adjust, easy to shift under load or even standing still and plenty durable for all manner of applications. Coupled with the Dynamic/Sussex STI-style shifter, and you’ve got a winner; fingertip control over the entire range of gears lets you fire off shifts as easy as you please. The Alfine doesn’t care whether the hub is under load or coasting when the shifts take place, but I’ve found that easing off the pedal pressure makes everything a bit smoother. The shifter itself takes a little getting used to. The hoods are comfortable and will feel very familiar to users of Shimano’s various STI “brifters”. The Alfine (and Nexus) hubs require a lot more cable pull to shift than a conventional derailleur-equipped bike, so a fairly long lever throw is required. The big lever on this Versa shifter travels almost 35 degrees, and I found quickly that using my longer middle finger to shift it made things work better. Two minor gripes about this shifter: initially, I found the smaller downshift lever to be in a somewhat awkward spot. Based on the way I wrap my hands around the brake hoods, I found on the first couple of rides that if I squeezed the lever bodies wrong, I would inadvertently press the downshift lever, triggering an unintentional shift. After the first couple of rides, I was more careful with my hand placement and this “problem” ceased to be. My other gripe is that this pre-production shifter seems to be a little finicky about upshifts — a rider has to be careful to press the lever all the way to its inboard stop in order to get a clean shift. I found that in some gears the shift wouldn’t be quite complete, causing a little bit of chain skipping. Luckily, hitting the lever again quickly was easy to pull off. Patrick Perugini insists that the production shifter won’t be so finicky — this pre-production version has a much cruder set of innards and all that has been refined by the manufacturer. The gearing range afforded by the Alfine internals, the 46 tooth chainring and 19T cog seemed adequate for all but the toughest hillclimbs. Set up this way, the range goes from a hair over 40 gear inches up to 108. That covers a lot of territory, and the ratios between them are fairly even. Still, with only 8 to choose from, there are times that NO gear is “just right”. That’s an inherent drawback to all internal hubs and doesn’t reflect in any way on the Dynamic system. To play with the gearing range, a rider can simply swap out chainrings (standard 130 mm BCD) or rear cogs for something more suitable to his/her terrain. 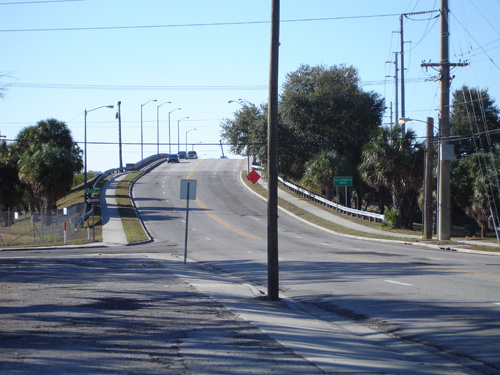 I don’t have much in the way of hills in my area (Tampa is pretty flat), but I’ve got a “test hill” on the North Boulevard bridge leading over the Hillsborough River — it’s where I take any bike that I get to test. This is a short but pretty steep pitch and lets me test the gearing range of a bike without too much hassle. Up this “hill”, I shifted down under load several times with no problem and I found this gearing range to be up to the task. Would I try to climb the Alpe d’Huez with this setup? Probably not…but anything short of that shouldn’t be too much trouble. The test bike came equipped with some good componets — Ritchey stem, handlebars and seatpost, a San Marco saddle, good Tektro dual-pivot sidepull brakes, Cane Creek integrated headset and decent Alex wheels. Nothing too flashy, but also nothing generic. Everything functioned smoothly; there were no issues to speak of. 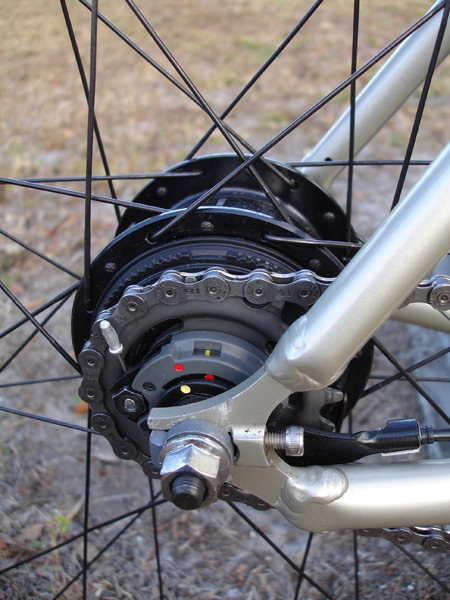 I’ve had a couple people express concern that the heavy Alfine hub (the bare hub weighs around three lbs.) would unbalance the bike. And, in fact, if you pick the bike up with your hands, it definitely feels “back heavy”. During rides (where such things really matter), though, this heaviness is completely unnoticeable. The bike rides smoothly and with stability. Another concern was overall bike weight. This bike is aimed at the performance enthusiast, yet the bike appears “piggish” at 21 lbs. Again, this isn’t noticeable…but that’s easy for me to say, because one of my primary bikes is a 60 lb. machine with a minimum of 50 lbs. of cargo onboard! So, to me the Synergy felt quick and racy. Bottom line is that bike weight is a good bit overrated — if a bike performs well, giving both a spirited and comfortable ride, it really doesn’t matter how much it weighs. Overall, I really liked the bike — I was already a fan of internally-geared hubs, but the fingertip shifting control offered by the Versa system is amazing. 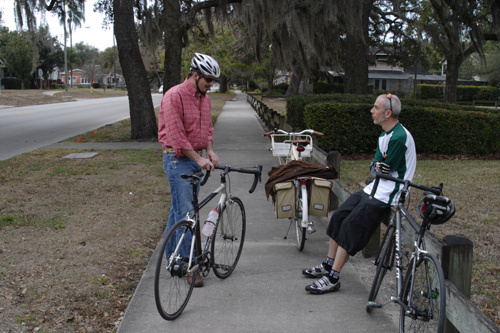 The bike rode the way I like a bike to — stable and confident without being too twitchy. Geometry is performance-oriented, but with some comfort features built in. This bike seems ideally suited for speedy club rides, fitness riding and, with the addition of a rack, fast medium- to long-distance commuting. Besides, with the ease of maintenance of the Alfine/Nexus hub family (no fiddling with high/low travel screws, “B tension” screws, etc. ), this bike helps simplify things for riders: more fun, less adjusting. Looks like Dynamic has another winner on their hands — and who knows; perhaps this shifter/hub combination may find its way onto other platforms (especially a more commuter-specific bike with fender clearances and the ability to accept fat tires)? Oh, did I mention the Synergy was fun to ride? Visit Dynamic’s website for more information on availability of this new model (projected for March or April?) and their line of other well-thought-out bicycles. 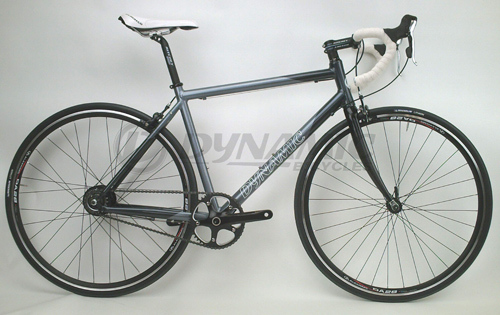 Dynamic’s “Synergy” Road Bike — first look! 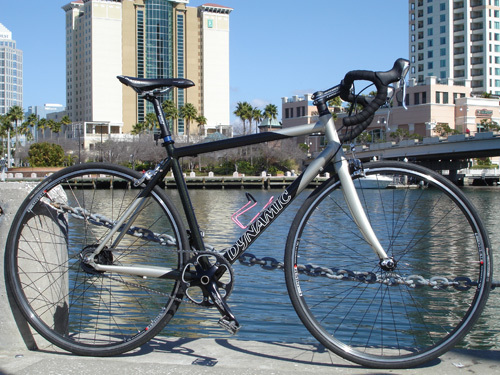 We’re really pleased to be able to unveil Dynamic Bicycle‘s newest performance-oriented machine, the Synergy road bike. The official release of the bike is scheduled for the Seattle Bike Expo in March, but the good people at Dynamic allowed the staff of Bikecommuters.com to be the very first testers outside of their own company. How do you like them apples? Dynamic is known primarily for its shaft-drive bicycles (the Synergy is a bit of a departure for them), and they’re not afraid of trying new drivetrain options around their company. We here at Bikecommuters.com have talked about the concept behind this particular bike before, and were blown away when Dynamic told us they were going to go ahead with this machine. Please bear in mind as we write about and show photos of this new bike that the version shown here is a pre-production model — a prototype, if you will. The production version will have a couple of minor differences in parts spec, paint scheme and frame characteristics, and we’ll show you a photo of that at the end of this first look. Billed by Dynamic as “the world’s first production internally-geared road bike”, this bike is aimed at the performance enthusiast who likes to think outside the box. With a drivetrain based around a Shimano Alfine 8-speed internal hub, the other item that really makes this bike stand out (and excites the hell out of me!) is the STI-style shifter co-developed by Dynamic and a Taiwanese component manufacturer. Up until this point, the only shift controllers for the Alfine and other Shimano internally-geared hubs were trigger pods or a twist-grip unit, neither of which was appropriate for a traditional road bike without some kludgy workarounds to get those shifters onto road drop bars. 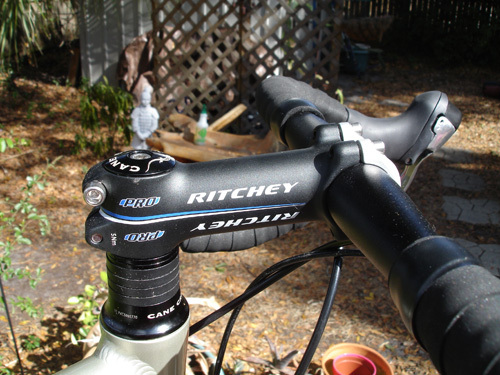 Not anymore — the Dynamic’s STI shifters are AWESOME and open up a world of tinkering opportunity for cyclists. I’d venture to say that if Dynamic offered these shifter units by themselves, they’d make a mint!!! That’s a little bit beside the point for right now, though. This Synergy road bike blends the STI-style technology and an IGH into a sleek, road-worthy package that is capable of some real performance. Parts spec on this prototype is very nice and include a couple of house-branded parts (crankset and external-bearing bottom bracket), Tektro brakes (R720 and R538), Ritchey Pro and Comp seatpost, stem and ergo handlebars, Cane Creek IS-2 headset and Alex 32 hole rims wrapped in some of my favorite road rubber: Vittoria Rubinos in 700c X 25. 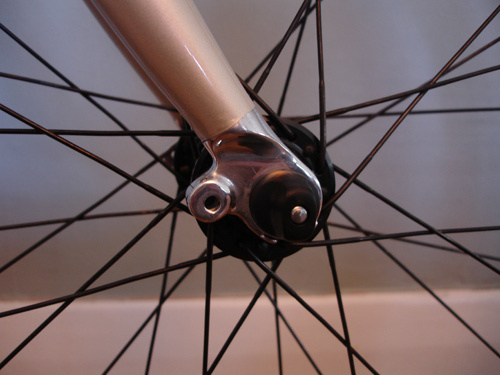 And, of course, the sweet Shimano Alfine hub. The frame is TIG-welded aluminum in the common “compact geometry” configuration with sloping top tube. There’s nothing particularly wild about the frame — merely a well-executed oversized tubeset with some gracefully flared chainstays. The pre-production frame comes with mounting points at the seatstays for a rear rack, but no matching eyelets at the track-style rear facing forkends. Patrick Perugini, president of Dynamic, assures me that the production frame WILL have those crucial eyelets to mount a rear rack. The pre-production frame’s carbon fork comes with eyelets for fender mounting, but as we saw on the OSO a few weeks ago, there’s little chance a fender will fit into those narrow spaces between fork, tires and brakes. I’m not clear as to whether the production fork will have those eyelets. Dynamic is loaning me this bike for testing purposes for only a few days — so I’ll get some actual reviews up pretty soon. I received it on Tuesday via UPS and have already put about 35 miles on it…and so far I can say that it is comfortable yet nimble, it performs very nicely from a functional standpoint and I’m really glad to see such a machine on the market. Oh, and by the way — Mercutio Stencil: great guess…you nailed this one! Thanks to the rest of you for throwing your comments into the ring. 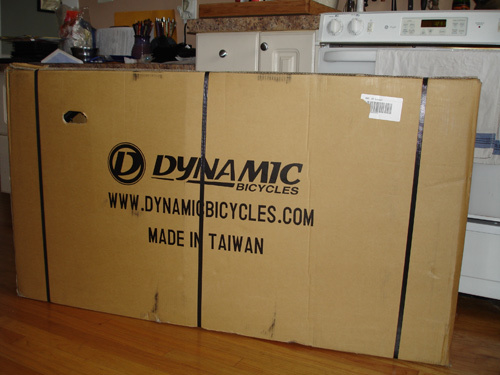 It’s the new model from our friends at Dynamic Bicycles…so new it hasn’t even been announced anywhere else! Wait a minute…Dynamic? Aren’t those the folks who make those shaft-drive bikes? Well, yes — and this is a departure from that. The new bike is a) a really great idea that we’ve talked about on this site in the past (the idea, not this particular bike) and b) fairly unlike anything else currently on the new bicycle market. It’s a road bike…but so much more (and a little less). How’s that for a tease that tells you almost nothing? Stay tuned as we get this machine unpacked, assembled and on the road. I’ll be posting a “first impression” article next week if all goes well, and then you’ll get more details about what makes this bike so different. One of the few drawbacks to being a product tester is that sometimes you’ve got to give whatever you’re testing back to the manufacturer. 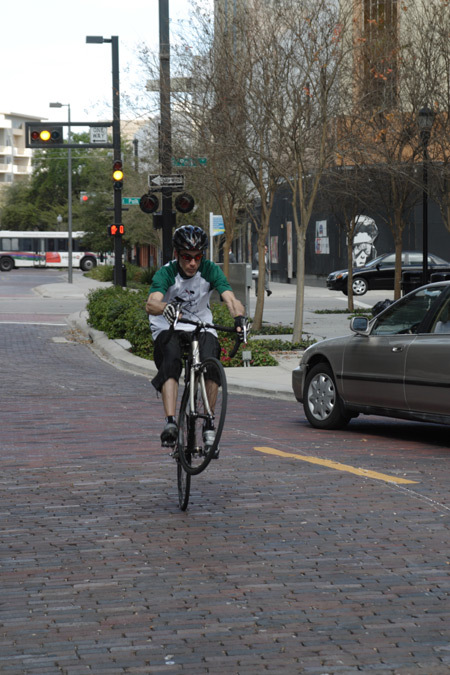 This is especially the case with bicycles — we’re usually given just a few weeks to run a bike through its paces. And so it went with the Dynamic Crosstown 7 shaft-driven bicycle that we reviewed a few months ago. I got to ride the bike for about three weeks…and in that time developed enough “feel” to write a credible review of the machine. Sometimes, though, a longer testing period would reveal even more about a product. 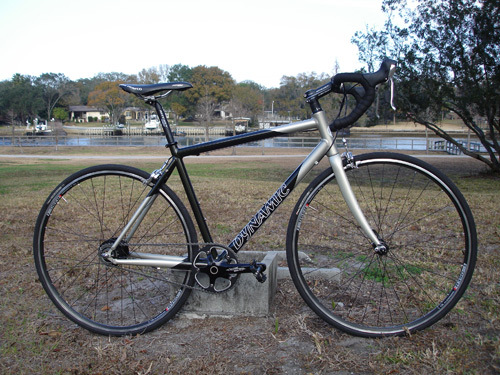 Faithful reader and fellow blogger Tim Diller comes to the rescue for this one — he purchased a Crosstown 7 and has ridden it over 1200 miles since he bought it. Check out his review here, and enjoy the rest of his blog — Chubby Grum Grum — as well!